The sixth Guru, Shri Guru Hargobind Sahib Ji, was born in 1595. He became Guru in 1606. 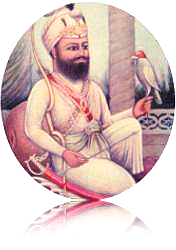 He built many religious shrines and felt the necessity of imparting the spirit of soldier ship to the Sikhs and urged them to be well versed in the art of using sword and other arms for self-defense and self-preservation. He himself wore two swords, Miri, representing political sovereignty and Piri, signifying spiritual sovereignty; a balance of material and spiritual life in the world.